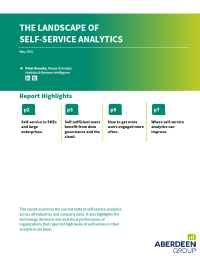 Download this report to examine the current state of self-service analytics across all industries and company sizes, and view the technology decisions and analytical performance of organizations that reported high levels of self-service in their analytical use base. Self-service analytics can empower users in many ways. If implemented in the right way, self-service can foster a larger user base that will make better decisions and disseminate insight across all lines of business.